When I went to grade school, students sat in desks. The walls were decorated with colorful posters and samples of students’ work. We had books, pencils, and crayons, and everyone ate lunch at the break. The two Malawian schools that our team of American teachers recently visited bore little resemblance to the schools of my childhood. At Chiwengo Village School, only upper grade students had desks, and often three students shared a table meant for one. In lower grades, barefooted children sat on a concrete floor. Classrooms designed to hold thirty students contained fifty to eighty…or in one first grade class, over 130. The chalk boards were ruined because the buildings were not weatherproofed. At Faith Academy in Mtsiliza village, class sizes were more manageable, but the facilities no better. The only lighting came from long, narrow openings along one wall or the bare door frame. There were no doors or glass panes to protect students from the elements, and gaps in the aluminum roof meant that the dirt floors would turn to mud in the rainy season. Neither school we visited had electricity or plumbing. Or more than a handful of books. We teachers came into these two schools, schools that hundreds of COTN-sponsored children attend, to bring teaching strategies, books, supplies, and encouragement to the students and teachers. We left with so much more. Here is a story that reveals much about the children of Malawi. These are the children of Malawi—giving thanks for what they have and using every resource to its fullest potential. Discarded plastic bags can be tightly woven to make a ball. A teacher’s bicycle contains all of the necessary parts for a geometry lesson. One piece of paper can be shared between two students—the back is every bit as useful as the front. Those broken pencils the students held out to us taught me a profound lesson about what God provides and how He reforms us into a new creation. “Behold,” Jesus said, “I make all things new” (Rev. 21:5). A broken pencil is not broken at all when the new ends are sharpened. Nor is a broken life. Consider the contrast between the village children who are COTN-sponsored and those who are not. We saw hundreds and hundreds of children whose clothes were in tatters, who were covered in dirt and mucus, whose arms and legs were alarmingly thin, whose heads had bald spots and sores. Many sleep without blankets on bare, dirt floors. Many—far too many to count—have no adults to care for them. The children who receive COTN support, on the other hand, eat two hot meals a day and go to school. Double-orphaned children also live in clean, warm group homes with aunties and uncles who love and encourage them, feed and clothe them, and help them with schoolwork. These children smile a lot. In the same manner, I can see the resources God has given me as mine—or His to transform. Thirty dollars can look like a trip to Target—or a fed child. Another fifteen dollars could be a gym membership—or a home for an orphan. 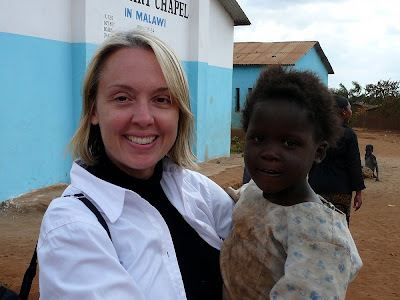 In Malawi, was I an American teacher instructing? Or was I a child learning? This is the Master’s work—taking one broken pencil and reforming it into two.